Richards Parish Walk Blog: 12th December 2010. 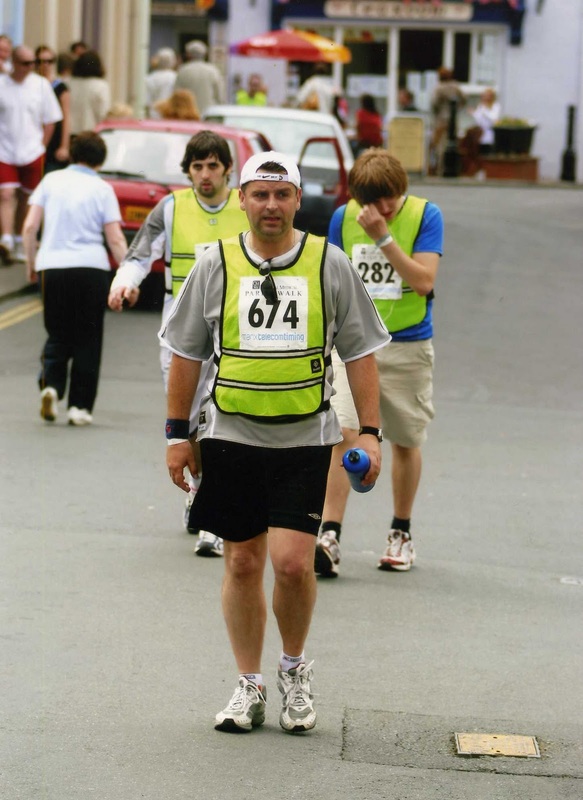 A build up to the 2011 Parish Walk, or "Why would I want to put myself through that....again?" My first day’s “training” involved walking to Hull city centre from my home, a distance of about 4 miles, buying new trainers, shorts and a rucksack, and then walking home. Then 4 days rest because my muscles had seized up, and I was chaffing in places that don’t bear thinking about. During this waiting time I applied for the race and started planning for the date nearly six months away. Someone suggested doing it for charity. I wanted an incentive, something to give me a goal which means I had to carry on rather than getting fed up and packing in at the first inopportunity, so picked two. The Humber Inshore Lifeboat which was associated with work, and Macmillan Cancer Support, which my mother had supported herself when diagnosed with cancer in 1995, a cancer which finally took her in 1999. It was to be a long and happy association with Macmillan which still continues to the present day, not only sponsorship for my walking, but volunteering for any other thing a could do because I saw what a remarkable charity it is. One of the things I did was help to set up the Annual Humber Bridge walk which raises tens of thousands of pounds every year. I had my goal and reason for continuing with the race. 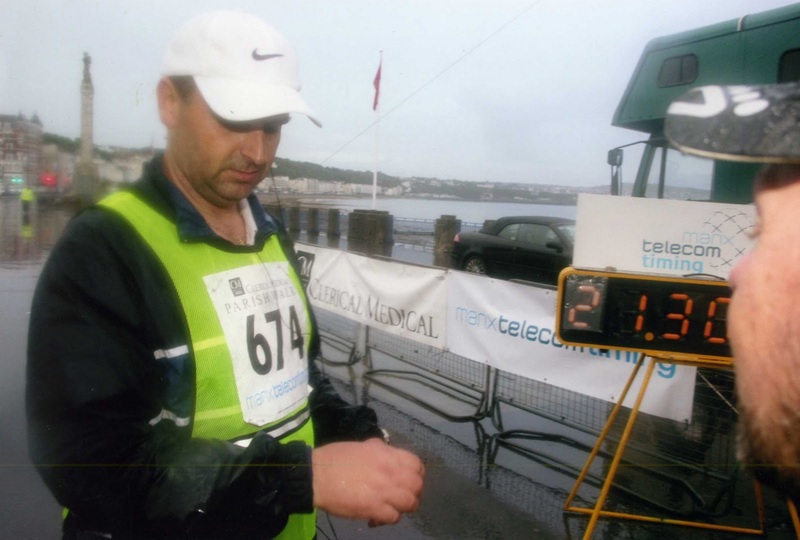 Once I had my sponsorship I realised I was going to make over £50 a mile, and whenever there were thoughts about stopping, it was a case of one more mile and another £50 first. An excellent incentive to continue. It healed quite well, and made me rest before the day arrived. I was down to just under fifteen and a half stone, blood pressure down, 10 year back problem cured (weak back muscles) and Cholesterol down to near normal levels. I had lost a couple of chins and people were mentioning how well I looked, always good for the ego. The race itself was a day to remember. I really underestimated the whole concept of 85 miles, but as a mid pace walker was constantly surrounded by others, chatting to anyone near the same speed. At the bottom of the sloc I bumped into Bertie Convery, and we chatted all the way to Peel, the whole thing passing without really noticing. She stopped for 5 minutes at Peel and I carried on, regrettably now as she stopped shortly after with a hip problem. Sorry Bertie, maybe if I’d have waited it would have been different and you’d have finished. One thing she asked was “How far are you going?” a question a few others asked as well. A question which surprised me as it had cost me hundreds of pounds to even get to the start line and the whole thing was a physical and mental challenge to prove I wasn’t turning into some couch potato. I had set off with the finish line in mind from the very start. When I told them this, there were a few wry smiles and shakes of the head. Heading through peel, just after leaving Bertie. At Ballasalla I had got a stone in my left shoe which had lodged in between my big and second toe, it was only by taking pain killers that I managed to ignore it. Stupidly I thought that it was only an irritation which could be ignored. Coupled with the pain in the leg muscles, back, and, surprisingly, shoulders, I was pretty downhearted between Jurby and Bride. As it also started raining, it seemed that it was taking forever. It was nearly nine in the evening when I finally clocked in at the top of the island, getting dark. Helen managed to get me a cup of tea, made by some still unthanked Bride resident, and one of the finest cuppa’s I’ve ever tasted. With a change of clothing and shoes; seeing with mild shock the blackened second toe. “Oh, that’ll fall off!” Helen casually mentioned while picking up my socks with a stick. More pain killers and off. The walk south was easier to Ramsey, then the worst part came. Climbing up to Maughold in the dark and rain, then up to the Hibernian. Nearly thinking of giving up a few times, but Helen was calculating that I was ahead of schedule, well withn the 24 hours, and keeping me going. Robbie Callister had long since finished and was probably tucked up in bed, but for me it was a way to go. It was here I found myself walking just behind Irene Taggart and Michael Bonney, which helped as I had no idea where I was. Tiredness was setting in so we talked sparingly, just encouraging and re-assuring there wasn’t far to go. The pain was unbelievable, cramping up legs and back, but I realised that you only get one chance with this. I knew that now I’d taken on the Parish, I had to finish it. I had less than a quarter of the race to go, and, unusually at the back of my mind, I was sadistically enjoying myself. Not the pain, but the fact I was taking on an unbelievable challenge, the sort of thing you only read about. I didn’t know where I was. In the dark and confusion I was pretty ignorant to how far I had to go. Helen was being vague, with a lot of “not far to goes” and “Nearly there’s” which helped, but, as anyone who has finished will tell you, the moment yyou come round Port Jack onto the Prom and the pain vanishes. 21h 30m 7s, half five on a drizzly june sunday morning, wouldn't want to be anywhere else. I was severely cramped up, Helen drove me back to Peel and stood laughing as I spent half an hour getting out of the car an “walking” into the house. I was dehydrated, cold to the bone, sick, I ended up lying on an inflatable mattress on the floor for two days unable to eat properly, having to plan toilet breaks an hour in advance. And I had a smile on my face nothing could wipe off. People ask, if your house was on fire and the family were safe, what would you go in and rescue? Without a doubt it would be my Parish trophies, all irreplaceable, the hardest thing I’ve ever worked for. Presentation, June 2007, with Robbie Callister, race winner. You can contact me with any tips, queries or questions at richardspenceley@btinternet.com Any advice on how I can shave a few minutes off my time would be most welcome. 47, Married to Denise, with two teenage girls, lauren 16 and Nicola 14.